The EFII Throttle Body Flange Adapter kit provides a convenient method to join a Van's Filtered Air Box or other flat surface interface to the EFII throttle body which is included in all EFII electronic fuel injection kits. 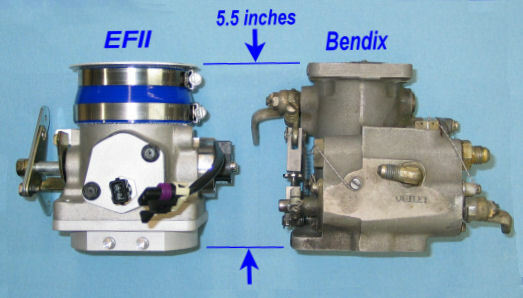 The EFII throttle body has a 3 1/4" rounded snout at its inlet. the TBFA kit includes a high quality silicone hose coupler which fits onto the EFII throttle body snout. The other end of the silicone coupler has a 3" ID which fits the included 3" aluminum flange adapter. 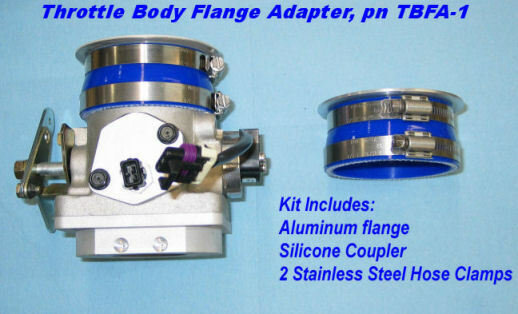 Stainless steel hose clamps are included to complete the assembly of the TBFA. The aluminum flange adapter can be riveted, bolted, welded or bonded to your air filter box or air inlet.